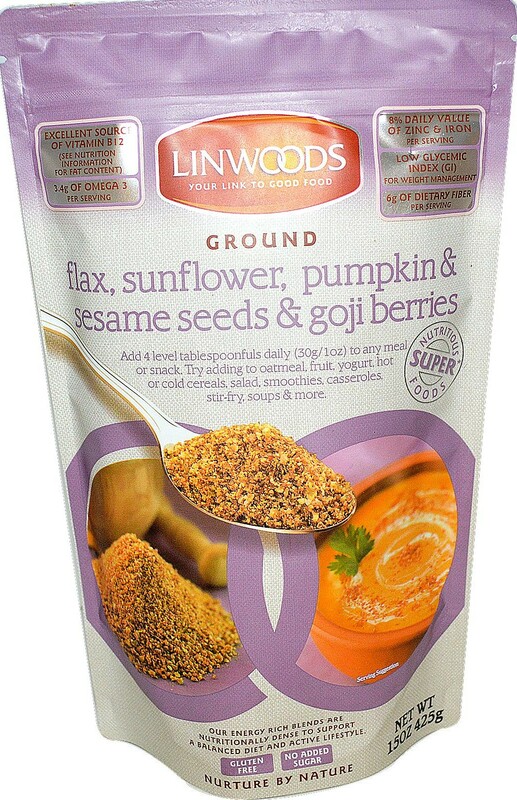 Linwoods is an Ireland-based company that manufactures a variety of superfood products including four energy rich blends referred to as Linwoods Health Foods. 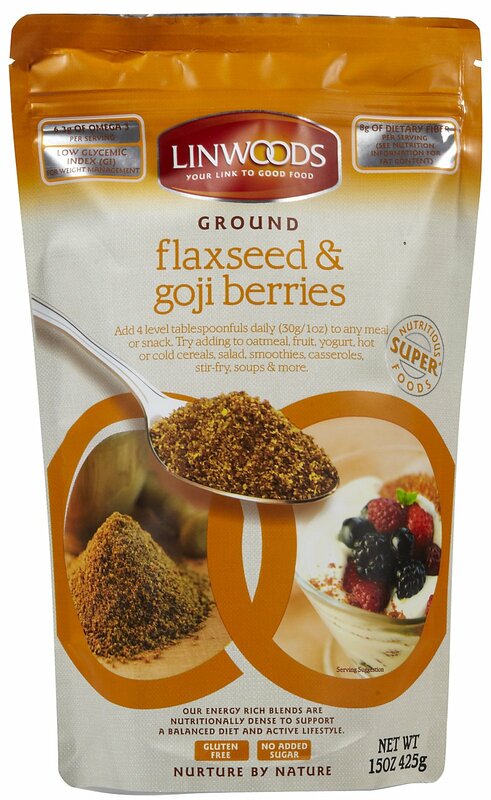 Made primarily of organic flaxseed that are cold-ground to protect the essential fatty acids and nutritional goodness and then blended with a variety of ground seeds, berries, or nuts, Linwoods Blends are high in protein (4-6 grams of protein) and fiber (5-8 grams) and low in sugar (1-2 grams) and sodium (30 mg) per 1/4 cup serving. Each serving has 155-178 calories and 12-15 grams of fat, which is primarily derived from the flaxseed. Ground Flaxseed & Goji Berries: 83.5% of this product is organic flaxseed blended with goji berries (15%) and cornstarch (1.5%) – to prevent caking. 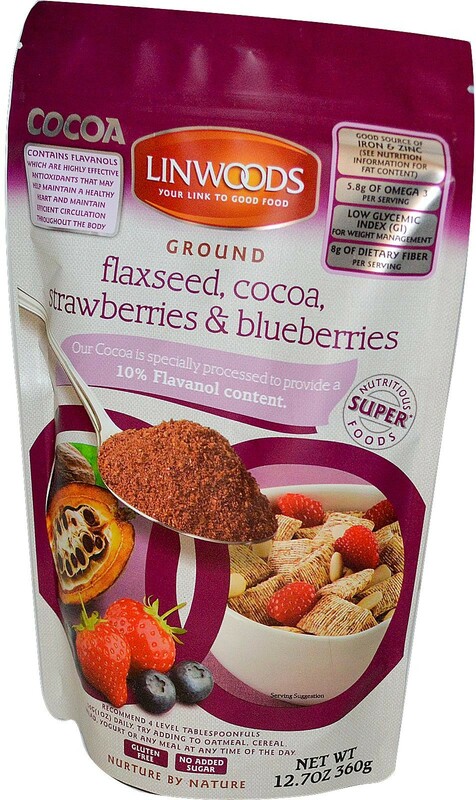 Ground Flaxzseed, Cocoa, Strawberries & Blueberries: This blend is made up of 86% flax seeds, 10% reduced fat cocoa, dried strawberries and blueberries (4%). 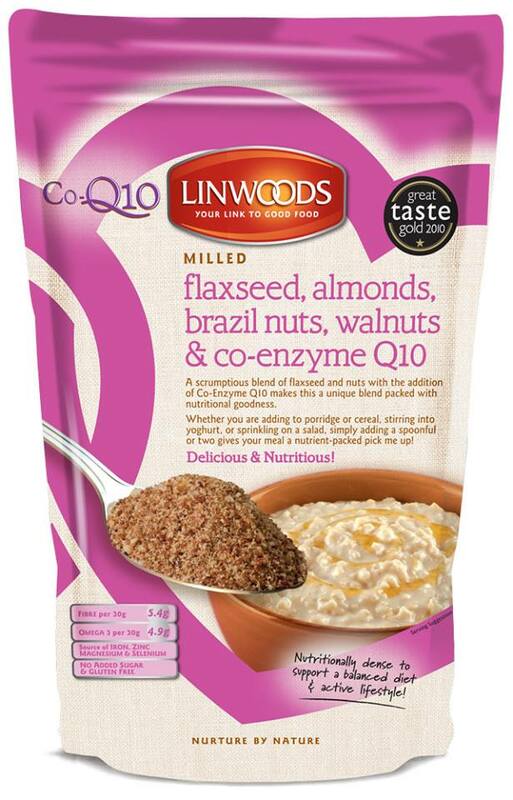 Ground Flaxseed, Almonds, Brazil Nuts, Walnuts, and CO-Enzyme Q10: This blend is a nut lover’s dream with flaxseed (69%), almonds (10%), brazil nuts (10%), walnuts (10%), cornstarch (1%), and C0-enzyme Q10. Ground Flaxseed, Sunflower, Pumpkin, Sesame Seeds and Goji Berry: Comprised of organic flaxseed (43;5%), organic pumpkin seeds (15%), organic sunflower seeds (15%), organic sesame seeds (12.5%), goji berries (12.5%), and cornstarch (1.5%). For those who prefer seeds over nuts, this blend is a delicious choice. Gluten-free , dairy-free, and with no added sugar, the blends are nutritious and delicious whether sprinkled over a prepared food or in a recipe. Each of the four blends are ground so they can easily be added to cooked oatmeal, hot or cold cereals, smoothies, pancakes, waffles, or any baked goods recipes. Packaged in resealable bags (12.7 – 15.0 ounce bags), the blends can easily be scooped out with a spoon and then resealed. Keep refrigerated after opening. The company also sells milled organic flaxseed, shelled hemp, and chia seeds. See the Linwoods website (listed below) for compete details. Linwoods Energy Rich Blends can be purchased directly from the company (www.linwoodshealthfoods.com) for $13.99 per bag plus free shipping or through www.amazon.com for $12.19 per packet with free shipping for Prime members. The blends are also carried in select Whole Foods stores.